The global photovoltaic (PV) market will reach 15 gigawatts total in 2010 and 25 gigawatts by 2013 (despite slower growth in 2011). Keep in mind that the global solar market was only 170 megawatts in 2000. Getting to one hundred gigawatts by 2020 is not out of the question. In fact, it's necessary for the credibility of the PV industry and for the sake of meeting Renewable Portfolio Standards and PV carve-outs. Germany installed 3.8 gigawatts by the end of June of 2010 and 2.13 gigawatts in June alone. And to that end, a number of solar firms will approach the one-gigawatt-capacity threshold in 2011, including SunPower, Yingli, Trina Solar, SolarFun and LDK. Approaching or exceeding the two-gigawatt-capacity level will be First Solar and Suntech. Several other firms such as Solar Frontier and Abound Solar plan to be in the one-gigawatt range in the near to midterm. As these companies reach massive scale, the obstacles to entry for VC-funded module and cell startups become even more formidable. A few years ago, the top solar cell and module vendors were Japanese and German. In recent years, China has emerged as the leading supplier of solar modules and now Chinese firms dominate the top ten solar producers. Suntech, Yingli, Trina Solar, Canadian Solar, SolarFun and other Chinese players have moved from the fringes of respectability to becoming producers of bankable modules with recognized brand names. The figure below from GTM Research's PV Technology, Production and Cost Outlook: 2010-2015 report lists the top 15 most competitive module suppliers for 2012 based on their efficiency, performance, bankability and adjusted module costs. 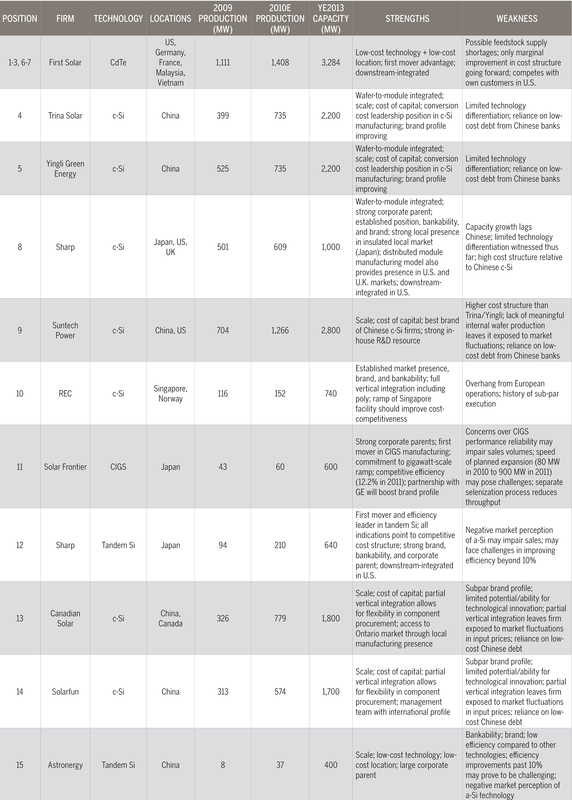 There are ten crystalline silicon (c-Si) firms on the list, of which seven are Chinese. Along with First Solar, these Chinese firms are going to set the price and efficiency pace of the global solar industry for years to come. The Obama Administration has done more for the promotion of the American solar industry than any U.S. presidency. Those efforts have taken the form of immense R&D spending, positive press and massive loan guarantees. There have been some missteps in the loan guarantees (see Solyndra below), but in total, the energy staff in the Obama Administration have been solar heroes. White House solar panels have had a shaky history, but in a strong symbolic gesture, PV panels will soon be back on the White House roof. Venture capital investors and their solar portfolio firms rely on a robust M&A pipeline to furnish the exits that make the VC ecosystem function. But exits via IPO or acquisition have been few and far between in this sector. Lucrative examples have been even more scarce. As such, the $305 million acquisition of solar project developer Recurrent Energy by Sharp sends a signal that solar is still a viable VC investment. Sharp got strategic and acquired a downstream player with a project pipeline and Recurrent found a safe home, a source of panels and a credible exit for their VC investors. Recurrent's investors -- Hudson Clean Energy Partners and Mohr Davidow Ventures -- saw a strong return on their initial $85 million investment. Note that this acquisition has its own flavor. It's the latest incarnation of 'Big Upstream Player Acquiring U.S. Pure-Play Developer.' Previous examples include MEMC's acquisition of SunEdison, First Solar's acquisition of NextLight and SunPower's acquisition of Powerlight. SunPower's Powerlight acquisition has shown that integrating downstream can improve a technology's competitiveness and overall margins, and can help drive the market. Fotowatio Renewable Ventures could be the next acquisition target in this vein. Perhaps we'll see the large Chinese module manufacturers like Suntech, Yingli or Trina start to get acquisitive for project pipelines and technology in 2011. This chart from our latest Solar Market Insight report says it all. 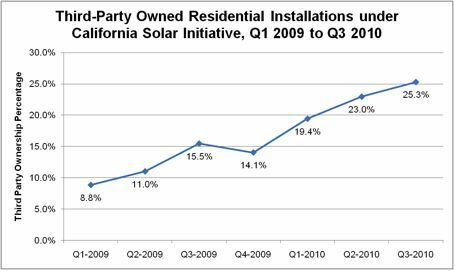 Residential third-party ownership of solar installations within the California Solar Initiative (CSI) soared from 8.8 percent to 25.3 percent since the beginning of 2009. Consumers want solar on their roofs, and the easier it is to finance and the simpler the installation process, the more residential solar we'll see. SolarCity, Sungevity, SunRun, and Clean Power Finance, all VC-funded, are changing the way consumers finance and think about solar. There is still a long way to go, but the solar-as-a-service, low entry fee, low involvement sales process is the best way to keep the momentum going in residential solar. We need to see more players in this space for it to competitive and ubiquitous. This was a good year for Applied Materials' solar business -- but it would have been a great year if the firm did not not have to write off $405 million in the mothballing of their SunFab amorphous silicon (a-Si) business. AMAT is still selling a-Si tools but the SunFab turnkey factory-in-a-box idea tanked. The lesson might be that just because something works in semiconductor manufacturing doesn't mean it's going to work in solar. We haven't written off a-Si -- there is still some life there, most notably at Sharp. 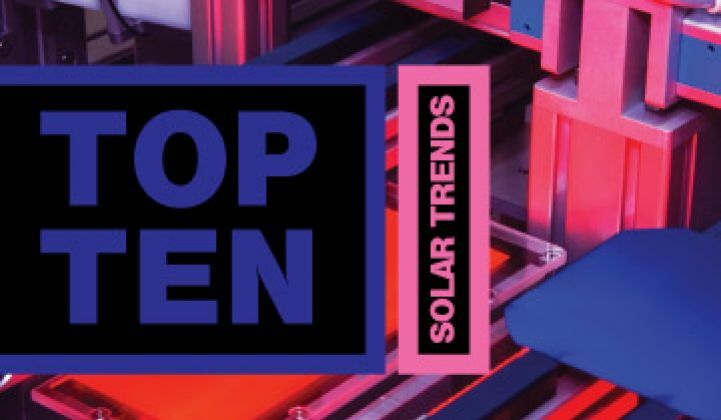 It's significant that Applied is not optimistic about the solar equipment business over the next few years given the impending factory oversupply situation. The panel-level solar microinverter is not a new idea -- a number of entrepreneurs have toyed with the idea in the last ten years. But entrepreneurship is not just intellectual property and fundraising. Enphase managed to take the inverter concept and convince an initially skeptical solar industry to adopt the new distributed inverter architecture in a big way. Enphase will finish 2010 having shipped in the neighborhood of half a million units over the firm's short lifetime. Enphase's success has spawned a number of competitors including SolarBridge, Enecsys and Petra Solar. Enphase's CEO, Paul Nahi, has stated that in a few years, the majority of solar installations will be based on microinverters. He might be wrong about that. Worth mentioning -- and part of the distributed solar electronics market -- are power boosters from SolarEdge and Tigo. The distributed electronics segment is still a tiny slice of the high-momentum solar inverter market, still dominated by industry behemoth SMA. In the words of Steve Rhoades, the CEO of Satcon (NASDAQ CM:SATC), "It's a good time to be an inverter company." Solyndra, the Silicon Valley CIGS thin film startup, drew heaps of attention with a radically different solar design, an enormous amount of VC fundraising, a fat government loan guarantee and a high-profile IPO filing. But the company's cost structure and value proposition failed to excite institutional investors, which forced the withdrawal of the IPO and set into motion a painful financial restructuring and a senior executive exodus. The firm is down but certainly not out for the count. Solyndra continues to win large-scale rooftop installations worldwide and pledges meaningful cost reductions. Can Solyndra reduce their costs to competitive levels? 2011 will be a pivotal year for the firm. 2010 was the year that utility scale solar in the U.S. broke through. With over 5 gigawatts of power purchase agreements (PPAs) under contract through 2015, U.S. utilities are finally becoming a driver of growth in the global PV industry. Despite the gigawatts of potential, the total amount of operating utility-scale solar in the U.S. is less than 250 megawatts. Most of the operating installations are dominated by First Solar and SunPower as project developers. But get ready for global PV players shifting their focus from saturated European feed-in tariff markets to the large-scale potential of the U.S. PPA market. The current market is valued at $1 billion per year and is scaling rapidly as utilities respond to looming renewable portfolio standards. GTM Research sees the U.S. utility market as a global industry driver over the next five years, with market potential approaching an estimated $8 billion per year by 2015. There are a number of challenges looming. Financing bottlenecks caused by slow economic recovery will be an obstacle to timely project completion. In some cases, the competitive PPA bidding process has led to contracts being signed at unworkable price points for project developers. These projects will rely heavily on stark PV price declines over the coming years in order to reach completion. Nevertheless, the scales are tilting in favor of U.S. utility solar. Despite the progress we wonder whether Concentrated Solar Power (CSP) is doomed because of the competitve edge in capex and LCOE that photovoltaics enjoys. In the U.S., absent a coherent energy policy, states made their own energy policy. In California, voters defeated Proposition 23 and voted for a low carbon future. California also opened up the potential for regulating energy storage with AB 2514. We saw the emergence of wholesale distributed generation solar with a number of new programs: Every California IOU has a program and California just approved a Renewable Auction Mechanism (RAM), while SCE has the RSC program and SMUD, a FIT. New York's NYPA has a 100-megawatt program, as does Arizona's APS. The U.S. federal government did keep the 1603 Tax Grant Program in place, and that could yield two gigawatts of solar installed in the U.S. in 2012. 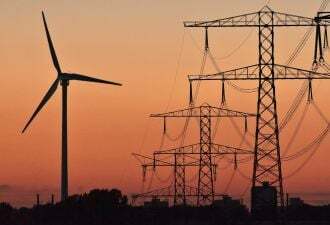 Globally, there were feed-in tariff cuts in Germany, France, Spain, and the Czech Republic, as well as shaky environments in the U.K. and Ontario. Looking forward to 20 gigawatts in 2011. Happy New Year. Greentech Media Research Analysts Shyam Mehta, Shayle Kann and Brett Prior contributed to this article, as did Greentech Media Editor-in-Chief Michael Kanellos.